The Jockey Club Information Systems' Horse Farm Management System is a management tool designed to assist farm personnel at all levels in managing information for more efficient day-to-day operations. Information such as Horse Inventory, Breeding and Health Record Information, Billing and Accounts Receivable Information for Board and much more are easily accessed. Store detailed information on all horses (Owners, Sire, Dam, etc.). 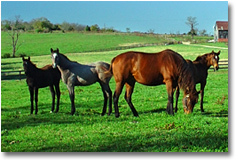 Store booking, breeding, and foaling information about all broodmares for each year. Maintain health and teasing records. Automatically calculate board and allocate charges to the appropriate owner(s) for billing and accounts receivable. Automatically schedule procedures and maintain a "tickler" file of future items which are scheduled. Retrieve information flexibly through a variety of reports and on-screen inquiries with user adjustable options. Copyright © 2019, The Jockey Club Information Systems, Inc. All Rights Reserved.